It doesn’t matter if your fridge is a decade old or is the latest in frost-free fridge-freezer. The fact remains that every six months, you have to manually check and get rid of any ice that may have formed in your freezer or elsewhere. If your freezer or fridge starts over-freezing or ice starts collecting everywhere in your fridge or freezer, your fridge’s capacity to cool food and beverages reduces drastically. The ice also takes up unnecessary space. Thus, the only solution becomes to remove the excessive ice. Yeah, it’s not the best job in the world, but someone’s gotta do it, right? Even though all appliances and electrical gadgets come with their own manuals, let’s be honest – we throw them out immediately or keep them in such a safe place that we’re unable to find them ever again! So anyway, here’s what you need to do. Make sure your fridge is disconnected. Unplug it and open the doors of your fridge and freezer. Remove all the beverages and food from your fridge and freezer. And while you’re at it, throw away food that has become old or has expired. If you have something like ice cream which may start melting immediately, consider keeping an icebox around where you can put it inside temporarily. Once the entire fridge has been emptied, it’s time to turn attention towards the shelves. Take them out and put them on the floor, especially if they’re made of glass. Take them to your sink, take out your gloves and dishwashing detergent, and give the shelves a good cleaning. Leave them out to dry in the sun and when they’re completely dried, just spray a little disinfectant on them for extra measure. Let the ice melt which is the core part of how to defrost a fridge. If it’s the summers, it’ll melt quickly but if in case it doesn’t, there are a few ways which can hasten the defrosting process.You can use a high powered hair dryer or blower to go from corner to corner to melt the ice. Another option is to pour some boiling water in a large bowl and place it in the fridge. Then shut the door, and let the steam melt the ice. Keep a mop or rag handy because you will need to mop up all the ice that is de-freezing, from time to time. You can go the smart way: take an old towel and place it underneath your fridge so that it can absorb all the water that drips down. Now, it’s time to clean the fridge. With everything out of your way – food, drinks and shelves, cleaning the fridge is no longer a chore. Use an old washcloth and an antibacterial kitchen spray to give your fridge a thorough cleaning. Don’t forget to get into the smaller crevices and corners that you would normally not give a second glance to. And remember to clean the doors and handles – they are always the dirtiest. Put the shelves back into the fridge and then one by one fill your fridge with your food and drinks. It is always advisable to put the food that’s fresh in the back and the one that’s older in the front. That way you can reach out for the older food and finish it before it goes bad. Plug your fridge back in. Voila! You’re done. Now you've known how to defrost a fridge, right? If you’re defrosting your fridge especially for the first time, do keep in mind the following points to make sure that the process is as smooth and problem free for you as possible. These tips are also helpful when it comes to your fridge’s maintenance. If you’re going to shop for groceries, it’s smart to defrost your fridge a day before. It will work as good as new the day you buy your food, which will help make it last longer in the fridge. 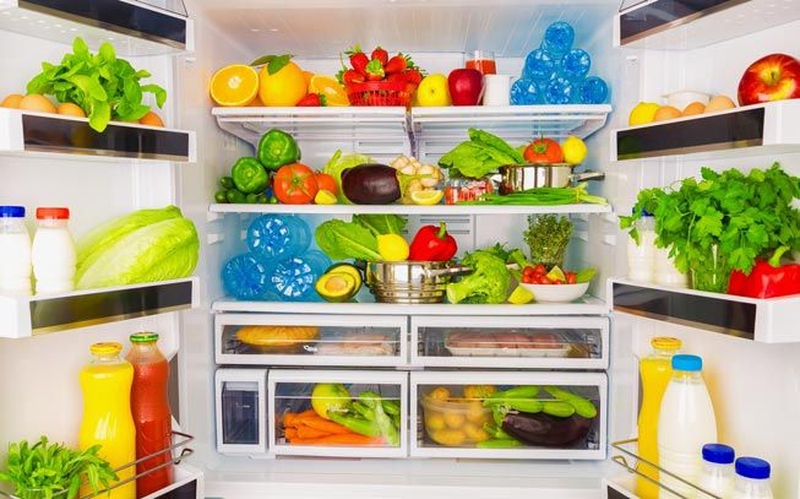 The outside of your fridge gets dirty more quickly than you realize. The dust especially can be a big problem, so make sure you dust the outside of your fridge at least once a week. Wear rubber or cotton garden gloves. They will prevent your fingers from feeling too cold when cleaning the inside of the freezer. If possible, every 3 months or so, get the surface of your fridge polished so that it can retain its original sheen or at least get as close to it as possible. If you have vegetable or meat drawers, be especially careful when cleaning them. Dirt can collect very easily in small crevices. The same goes for juices or wines that have leaked from their boxes. Do keep this in mind when working on how to defrost a fridge. If dried up food is sticking to a surface, then simply spray it with water or cleaning agent, let it remain like that for 5-10 minutes, and clean it off. It’ll come off much easily. If it doesn’t, spray it again and let it sit for 10 more minutes, and you’ll be good to go. Server responsed at: 04/22/2019 2:29 p.m.